A radical gender theorist and performance artist’s memoir makes its eye-catching subtitle look staid. Kate Bornstein started life as Albert, a Jewish kid on the Jersey shore who knew when he was four and a half years old that he wasn’t a boy. Bornstein’s path was predictably complicated from there, but the lengthy list of problems she lists in her prologue astounds: she suffers from leukemia as well as anorexia, borderline personality disorder, post-traumatic stress syndrome and a history of cutting; she’s a sadomasochist, a transsexual and a former member of the Church of Scientology. Furthermore, A Queer and Pleasant Danger states from the outset its purpose of hopefully someday introducing Kate to her daughter and grandchildren, currently estranged. If this list of disorders and minority statuses sounds alarming, never fear. Bornstein is funny, flippant, irreverent and witty. We follow Albert as a child in Jersey, a student at Brown, post-graduate studies in theater at Brandeis and the search for meaning that brought him to Scientology; then on his journey to become Kate, through a new life in San Francisco, Seattle and finally New York, with a series of relationships of every arrangement imaginable (and unimaginable). She generally has a good time, especially after becoming Kate, and her story ends on a positive note. Her tone is most serious in discussing the world of Scientology, which she presents as decidedly distressing and wacky, but her voice overall is impertinent and great fun. 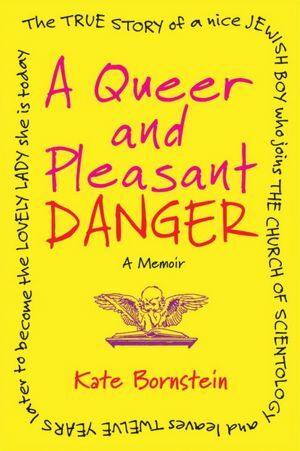 A Queer and Pleasant Danger is not for the faint-hearted, for reasons that become fairly evident (see: sadomasochism), but is ultimately uplifting, hopeful, even joyous–and always droll. This review originally ran in the May 11, 2012 issue of Shelf Awareness for Readers. To subscribe, click here, and you’ll receive two issues per week of book reviews and other bookish fun!